From his groundbreaking graphic novel series THE SANDMAN, his bestselling novels NEVERWHERE, AMERICAN GODS and ANANSI BOYS to his dazzling collection of short stories, FRAGILE THINGS, Neil Gaiman's startling imagination has manifested itself in strange and sublimely inventive fiction. STARDUST is now a major film from Paramount Pictures. 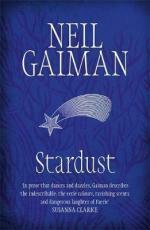 Reading Neil Gaiman's STARDUST is the next best thing to going to Faerie yourself. STARDUST is charming in every sense of the word, and deeply satisfying. A very fine and imaginative writer. Gaiman is simply put, a treasure-house of story and we are lucky to have him.